Protein drinks are used by a variety of people, from bodybuilders to dieters. Not all protein drinks are the same. Some are packed with nutrients and are high in calories to provide energy for exercise, while others serve as healthy meal replacement options and are part of a dieting program to promote weight loss. Knowing the types of protein drinks available can help you choose the right product to help you reach your personal dietary goals. Ensure nutrition shakes come in six different varieties: Nutrition, Plus, Bone, Immune, Muscle and Clinical. Some of the varieties are available in several flavors. Each shake is high in protein and contains a number of essential nutrients. Ensure Nutrition, for instance, contains 9 g of protein, or 18 percent of your daily value. It also contains vitamins A, C, D, E, B-6 and B-12, calcium, iron, magnesium, zinc and niacin. Each variety has between 250 and 350 calories in one 8 oz. serving. 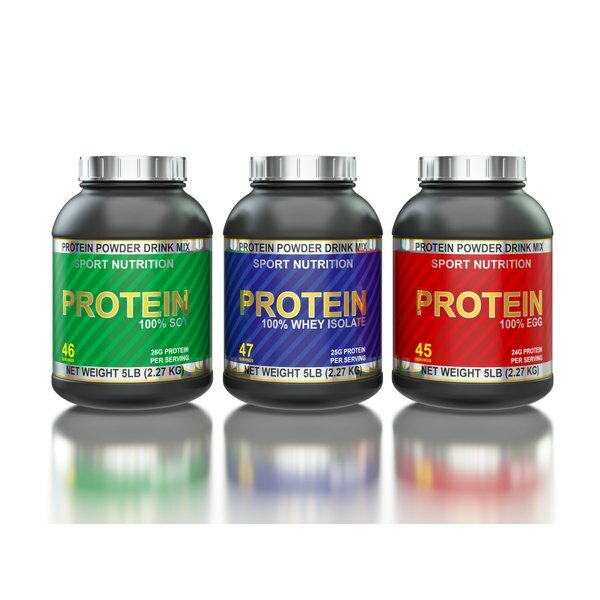 Ensure's protein content is relatively low compared to protein drinks that are designed for athletes and bodybuilders. The dietary supplement maker CytoSport makes a variety of Muscle Milk products that include protein drinks, including regular ready-to-drink Muscle Milk, which is available in chocolate and vanilla flavors. Muscle Milk nutritional shakes also include the lactose and gluten-free banana cream, which contains 21 g of protein. The drinks, according to CytoSport.com, promote muscle recovery and lean muscle growth. Muscle Milk Light Chocolate and Cafe Latte varieties are also available and are designed to help quell food and snack cravings. Boost protein drinks are targeted at families and marketed as a healthy energy source. Boost varieties include Boost Drink, Boost Plus, Boost High Protein, Kid Essentials, Boost Glucose Control and Boost Calorie Smart. The original formula in Boost Drink contains 240 calories, 10 g of protein and 26 vitamins and minerals. The varieties, according to Boost.com, can be used with a meal and as a healthy in-between meal snack. Boost Glucose Control contains a special formula that helps regulate blood glucose levels, while Boost Calorie Smart provides much of the same nutritional value as the original formula, but contains only 190 calories. Myoplex protein drinks are designed for strength training and are packed with carbohydrates and protein. Myoplex's four varieties include Original, Strength Formula, Lite and Carb Control. Some of the varieties are available in several flavors. The Myoplex Original formula contains 300 calories, 42 g of protein and 24 vitamins and minerals in one 17-oz. serving. The Myoplex Carb Control formula aims to help manage weight gain and has only 25 g of protein in comparison to the original formula. It also contains only 2 g of carbohydrates.